This is probably a good time to disclose that I was recently asked to serve on Internet & Media Advisory Committee (INMAC*) under MDA. INMAC is the new committee formed in April 2007 to advise MDA on ongoing media literacy initatives, industry co-regulation policies and other regulatory operational issues. Chaired by Stephen Yeo, the other members comes from various media and academic background. I am probably the youngest member. We had our first meeting today. It is very nice to finally meet Cherian George. I dont think I should talk about what goes on in the meeting so no details right now. Happy is when I receive a call from a reporter who wanted to do a story on Citizen Journalism a few weeks ago. Excited is when I see a Special Edition on today Straits Times titled. “For the People, By the People“. I even bought a copy for the first time this month! Shock is when all I see is pages and pages of self-promotion of Straits Times own online forum STOMP. How much self-promotion do you need when you have STOMP icon on almost every page of Straits Times everyday? Sad is when I realized the opportunity for the mass to understand Citizen Journalism became a shameless self-plug. That all significant online activities that references to STOMP “competitors” was conveniently left out in the reports. 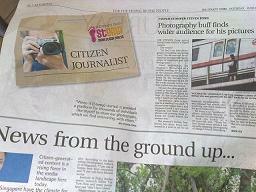 Irony is when I see the paper declared “STOMP – Singapore’s one and only Citizen Journalism”. Would the real Citizen Journalism in Singapore please stand up? Speaking of which, I really enjoy my dinner with the founder of happytxt.com last night. He might not be the smartest or the most knowledgeable, he is definitely the most passionate I have met so far. He really love his work. To him, happytxt is not just a project, or a business or something that will make him rich (it didn’t even cross his mind). To him, it is his work of love. And he enjoys every minute doing it. Yesterday, I was talking to a Chinese reporter. At the end of the phone call, she suddenly complimented my Chinese, as she is surprised. This also happens a few months ago, while I was doing a Chinese radio show. Now, I am not trying to boost here. I being to China and Taiwan enough to know kids there speaks better than I do. What concerns me is that if the reporters complimented my Chinese, I wonder what Chinese standard do they get from average Singaporeans? As I was telling my wife (who was an ex-Chinese teacher) last night, if my Chinese is considered good in Singapore, there is no hope for an average Singaporeans to ever do business in China. For the Singaporean out there, lets do a simple test to see if you can translate the following sentence without to resorting to mixing it in English. Common phrases, you would likely to use in everyday life. 1. Can I have the bill? 2. I will send you an Email later today. 3. Please call for a cab for me. 4. My name is David and I represent Microsoft. 5. I will upload the document to the share folder later. In case you haven’t notice, I got a legal letter from lawyers representing Grand Seasons International today. We are now seeking legal advises on the next step. We act for M/s Grand Seasons International Pte Ltd.
Our clients instruct that a blog has been published in your Bulletin of Singapore Bloggers at the following url address: http://tomorrow.sg/archives/2006/10/23/grand_seasons_international_ti.html with the heading in bold “Grand Season International-TimeShare Scam Company”. We are instructed that the above words are defamatory of our clients and our client’s reputation and goodwill has been disparaged and seriously damage. It is common knowledge that the Internet has millions of users who have free and open access to the words complained of. In the premises our clients instruct that unless the above offending words are removed from the above url address and from the bulletin board within the next 5 days from the date hereof our clients shall have no alternative but to proceed as they deem fit in the matter. Our clients also seek your co-operation to disclose the name and address of “GECKO” who has posted comment on 23/10/06 regarding our clients in the captioned matter as our clients intend to pursue their legal rights against the writer. Okay, I am down with Conjunctivitis for the last two days. It started with my daughter complaining about her eye pain last week. Sunday morning, she developed a full-blown red-eye and we bought her to see the doctor. By lunch time, my eye started to sore and by evening time, I had my red-eye. I canceled all my appointments and see the doctor the first thing in the morning on Monday. This is followed by my baby son and wife in the evening. On a lighter note of things, I had a drinking session last week at a place where the price of the beer varies depending on the time you were there: $2 at 11am to $9 at 10pm. MCMC stated that, based on the numerous complaints it received, the issue involved mobile users who claimed they are being charged for services/content which they have NEVER subscribed ot purchased. For the problem to escalate to this massive scale, it must have being going-on for a long time now. A research for a next generation Internet (I blog about GENI earlier last year) made it in the mainstream media (TIME) with a sensationalized title as above. No, there are some problems with Internet and we need to work on those. And we are working on those from a clean slate. But no one in the right mind is actually proposing to scrapped the current Internet. But hey, what do I know? The TIME title is probably more exciting then “Global Environment for Network Investigators Project”. Someone send me this article; it is too good not to share this. Pearl Before breakfast, an investigative story about putting the one of the world best violinist (Joshua Bell) in the Metro and watch what happened. It is so sad. Only a few stop to give money. Even less stay on to appreciate the music and only one recognizes Joshua. Perhaps sometimes we should slow down, listen to the music and smell the flowers. An email reminded me about the interview I had with SG Entrepreneurs. Check it out if you are interested.